We have already decided this will be our special-day (often holiday) breakfast casserole FOREVER. It is THAT good. 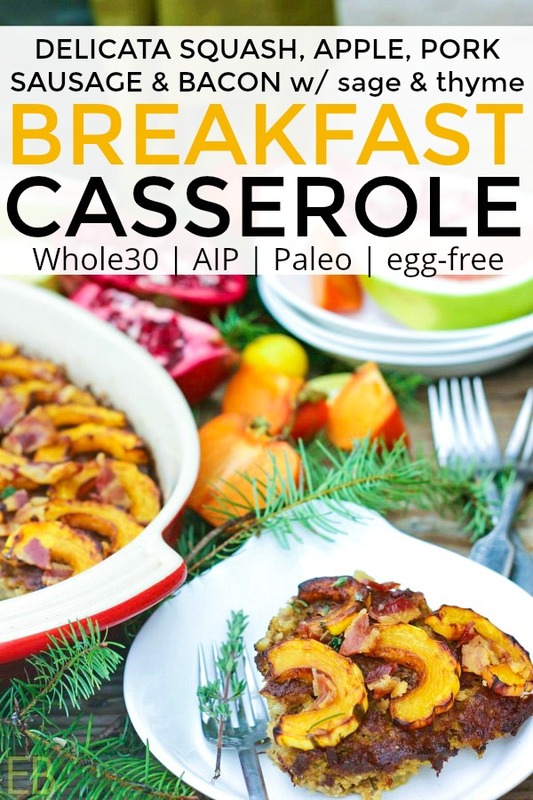 Whole30 & AIP! 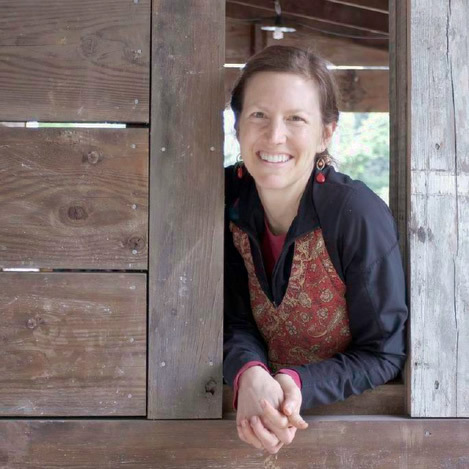 — That means an egg-free, grain-free, dairy-free casserole! That’s AMAZING! And yay, for Breakfast!!! 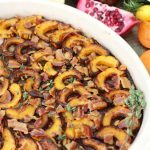 You, too, will love this Delicata Squash, Apple, Pork and Bacon Casserole, with lovely sage and thyme. In our grain-free, sugar-free family we have one egg-free child and one dairy-free child. Those big eggy, cheesy casseroles you see — They’re out, forever. 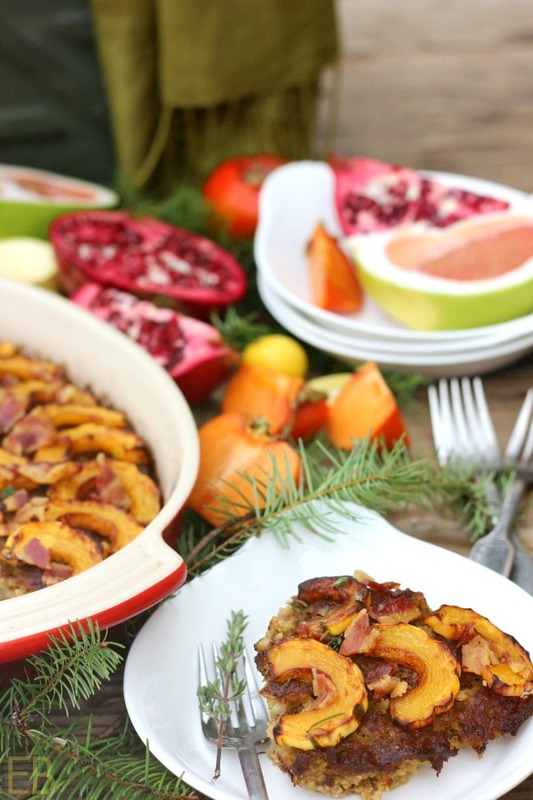 I made this casserole for all of my AIP and egg-free loved ones, but we (all of us, even those who can eat eggs and cheese) have been so blessed by it ourselves. I’m sure we’ll eat it other times throughout the year, too; but it does ring of special things. 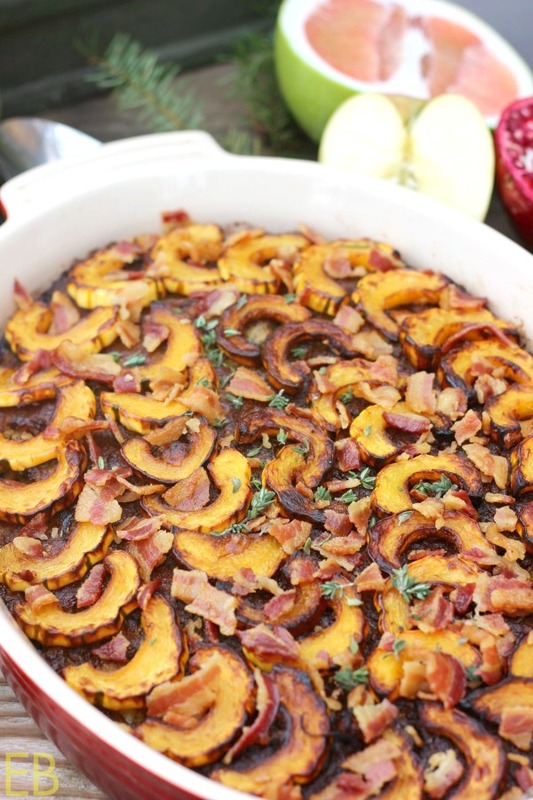 Please don’t skip any of the ingredients, like the bacon, the delicata or the fresh thyme. They each make this dish SO delicious, all together, and each of them punching you in the mouth separately too, with their AWES of goodness: the sweets, the salty-tangy, the rich, the herby-good. Okay, without further ado– the recipe! Enjoy, and let me know in the comments how you love it! Spread bacon out on a large baking pan (a half sheet is preferred, see link below in Recipe notes, or use two pans [with bacon pieces evenly divided between the two pans] if you don't have one big one). Bake bacon 10 minutes, until fat is partially rendered but it's not yet fully cooked. Remove pan from oven. Move bacon over to one side of pan, the pieces very close together. Add delicata slices, *coating each slice on both sides with the rendered bacon fat* as you lay them down close to each other. The pan will be full, but it will all fit perfectly. Bake in 400 degree oven about 13 minutes, until bacon is cooked perfectly and squash is cooked, but not all of it is browned. 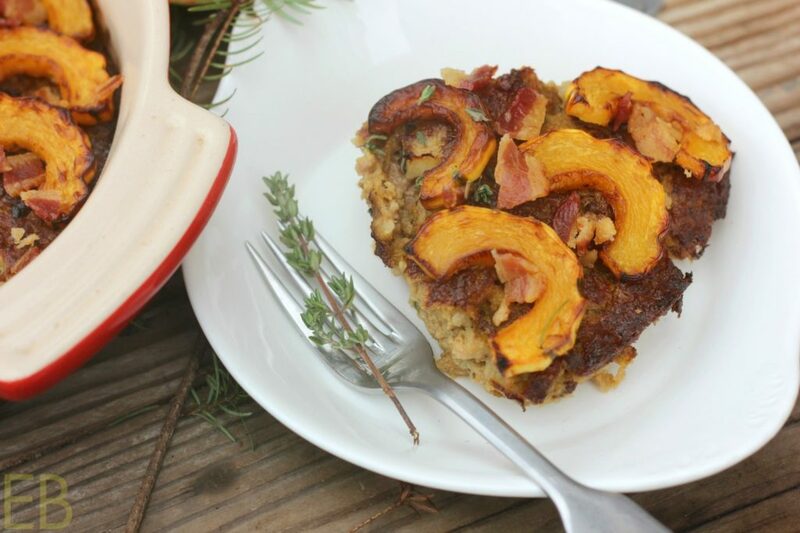 While bacon and delicata are cooking, combine in small bowl: cassava flour and sifted baking soda. Set aside. In large bowl combine: pumpkin, water, vinegar, sea salt, sage; mix well. Add cassava mixture and mix well. Fold in apples. Pour into prepared casserole dish, smoothing out the top with your finger tips or the back of a spoon/fork. Place casserole into oven. Set timer for 25 minutes. 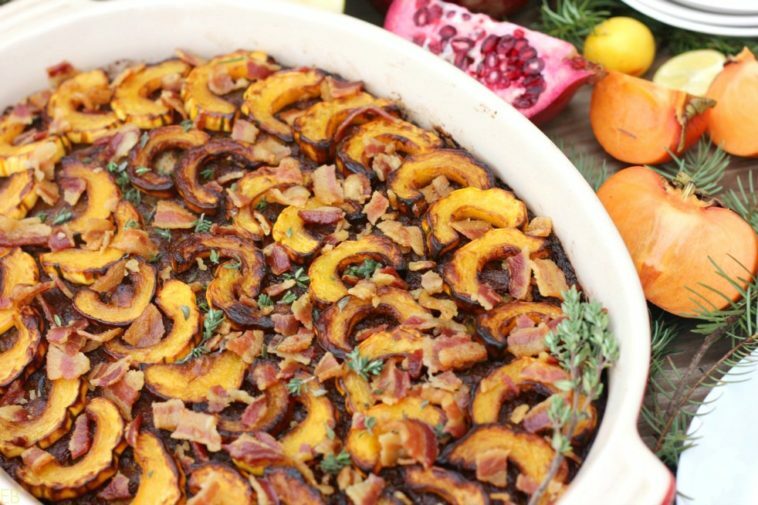 Remove casserole and decoratively arrange top with delicata slices. Return to oven. Bake casserole 8-10 minutes. Watch it closely because delicata can get too dark very quickly. You want them browned, (but not burned). Remove from oven. Crumble bacon pieces all over the top. Run your fingers down the tough stems of the fresh thyme, perched over the top of the casserole, topping the casserole with fresh thyme. Try not to skip this ingredient. It is LOVELY and really finishes the casserole beautifully flavor-wise (as well as visually). SERVE! 🙂 Or the casserole can sit for up to 15 minutes before serving. Here are the baking pans I recommend. They're very versatile and will last a lifetime. They're large and safe for everything except citrus and tomatoes (nothing reactive). Perfect for baked goods and bacon. 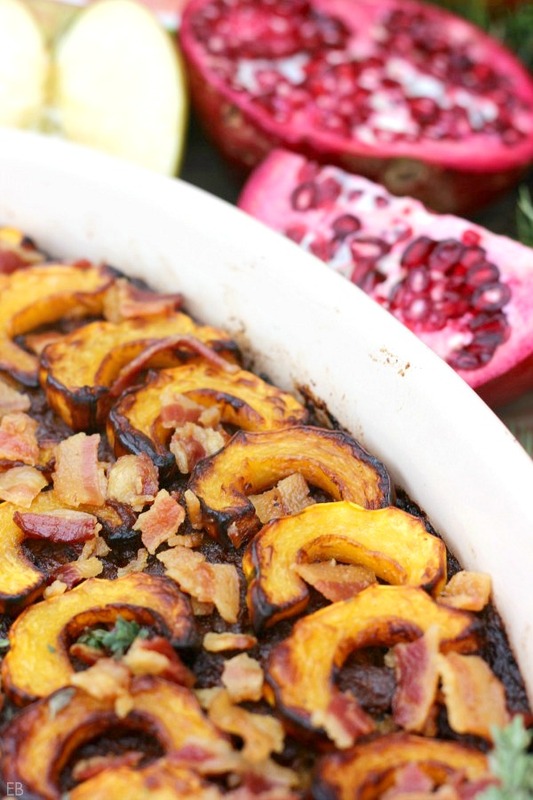 Have you eaten delicata squash before? I believe you meant fresh THYME for the top of the casserole at the end of the recipe, not sage. Thank you!!! 😉 Yes! I’ll change it now! This looks amazing! Delicata is one of my favorites! Thanks, Joni! Mine too, it’s SO sweet and good in this recipe! Love what it adds! Those 2 lbs of pork – is it ground? Yes! 🙂 Sorry to have left out that important detail! 😉 I’ll add it in now. The casserole is, as you say, a blessing. I made half a recipe for two people + leftovers. Keep on with the descriptive words like “slightly fluffy and lovely” – it helps us know we’re on the right track with a new recipe. So tasty! Delicata is such a treat! 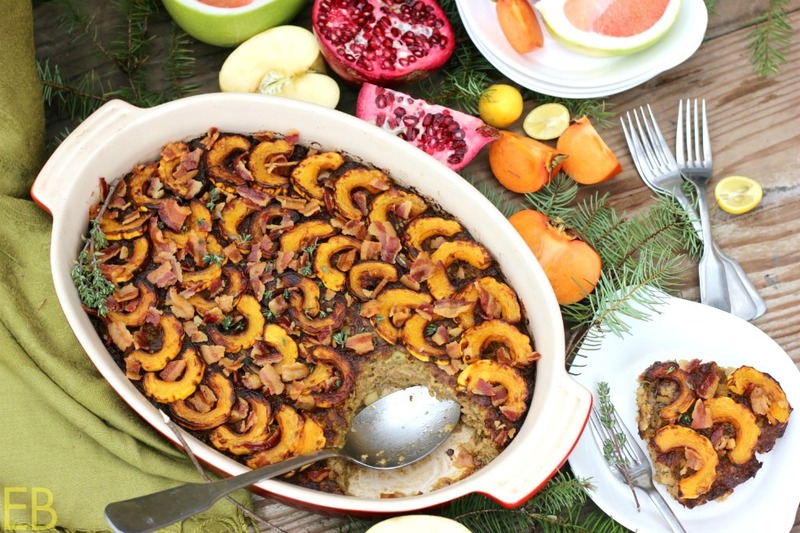 This breakfast casserole is exquisite! Oh yeah, I’m about to make this deliciousness. But first, any ideas on what on what one could use to replace the cassava with? Thanks for your awesome recipes! Hi Fawn, thanks! Yes, you can likely sub in 1/4 cup coconut flour (or 2/3 cup sprouted nut/blanched almond flour if you’re not AIP). I haven’t used the coconut flour sub myself, but I have made enough similar subs that I think it will work well.